Didn’t go to medical school? Me either. Didn’t go to nursing school? That’s a ‘no’ for me too. Ever care for someone who is (was) sick or dying? Me too. Did you feel prepared? I had no idea just how unprepared I was to help care for my mother when she was given a terminal cancer diagnosis at the age of 54. But it had nothing to do with how little medical knowledge I had. Being unprepared is what happens to anyone who cares for someone they love. When our care meets our love for someone, we can’t help but be unprepared. Caring for someone you love doesn’t have visiting hours. Our care is a 24-hour labor of love. It doesn’t take off holidays and it works on the weekends. It can’t be quarantined to a hospital room or rehabilitation center. It’s in your home. It’s everywhere. It’s on your mind when you’re sitting next to your loved one and it’s in your head and heart when you’re thousands of miles away on a business trip. And you can’t protect yourself with the mask of objectivity. That’s your mother you’re sitting next to. Or your brother. Or your sister. Or your grandmother or grandfather. You helplessly watch them when they sleep. And the thought of them not being with you in the future gives you nightmares when you sleep. Unprepared? It’s not something I’m ashamed to say I was when I helped care for Mom. It’s a badge of honor. Being unprepared means knowing that care is the only thing you can give when you can’t promise that it will all be better. When someone asks me now if I had wished I was more prepared to care for Mom when she was dying, I proudly tell them “No.” Being prepared means outsourcing all of your care when the person you love most needs you the most. Thanks for the kind words Lindsey. You speak from first hand expeirence and as you say, caregiving clearly does not discriminate across all ages, backgrounds, etc. 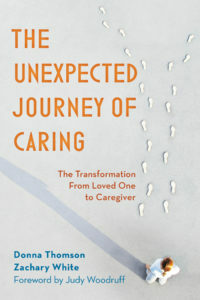 Hope you find the Unprpeared Caregiver resources helpful and reassuring. Best, Dr. White.